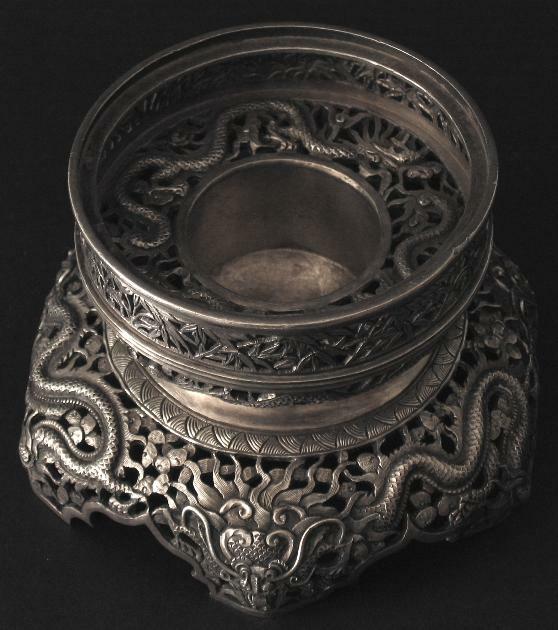 This exquisitely worked silver lamp base is the product of Chinese silversmiths most probably in Vietnam. It is finely pierced and chased with swirling dragons and bamboo motifs. It sits on six legs each of which is decorated with either a dragon head or tail. The interior of the stand is also pierced and has two dragons amid stylised cloud motifs. The base is marked with two shop marks. Each comprises the letters ‘RYY’ or possibly ‘KYY’ and an indistinct mark which appears to be a Chinese ideogram. Overall, the level of craftsmanship is superb. It is possible that the lamp is of mainland Chinese workmanship. 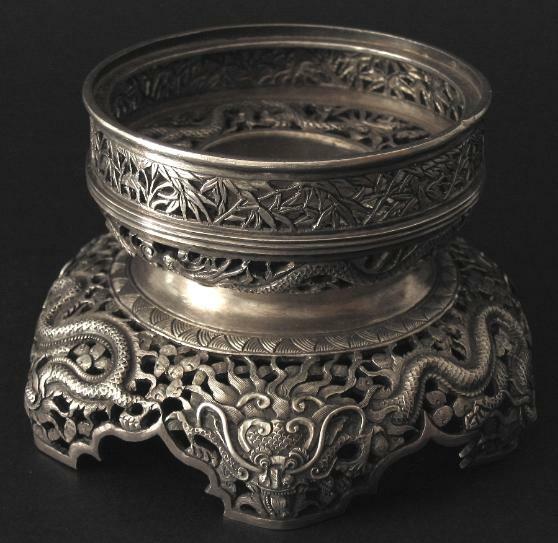 However, the style is more in keeping with Vietnamese motifs and no mainland Chinese silversmith using the mark RYY (or KYY) has been published. An opium lamp base such as this would have belonged to a wealthy aristocrat or merchant.